The award-winning MD3183 T2 Deluxe Inflatable PFD with HIT (Hydrostatic Inflator Technology) is Mustang Survival's top-of-the-line inflatable PFD. 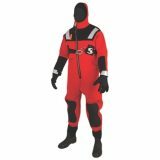 Designed for serious users with exclusive technology that enhances safety and minimizes maintenance, this is our most popular inflatable PFD. The MD3183 T2 version features 64 square inches of SOLAS reflective tape on the outer shell and back flap. The back flap can be custom-screened for company or agency identification. 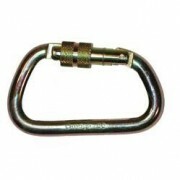 Screw locking carabiner with the same "D" shape as the 7/16" model, but with bigger material for increased strength. Same great handling and use characteristics but with a strength rating of 65 kN (that's over 14,000 lbs.! ).